Give them a Holiday to Remember! Keeping your brand at the top of your client’s mind is not always an easy task. One of the best ways to get their attention is to give them something unique for the holidays. One thing a woman hates most is to have to put her handbag on the floor. Not to mention the harmful bacteria that can be picked-up by doing that. The Pocket Book Holder instantly solves that problem. It’s a compact tool available in various colors that allows you to hook your bag right on to the table! The VisionSteel Value Tumbler is an attractive gift. It’s a high quality promo at a great price, as low as $7.20. It makes a great non-profit promotion, sports and fitness gift, or corporate gift. Travel drink ware is also a good marketing tool for automobile service companies, coffee shops, banks and retail stores. What I like most about this tumbler is that it if fits in to your automobile beverage well. Also it’s attractive brushed steel accents and stainless steel lid. To me, anything laser engraved looks and feels like a valuable gift. 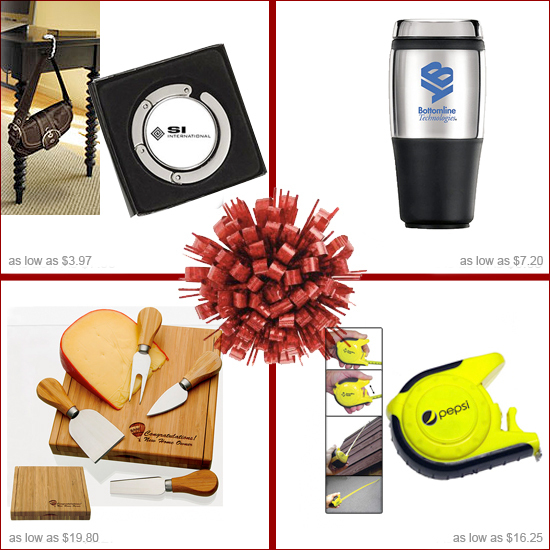 The Bamboo Cheese Set makes the prefect executive holiday gift. Bamboo is durable and attractive. The best part is that it is a clam-shell style case with magnetic utensil holders! As low as $19.80. Create a measurable impression with this Power Tape Measure. As low as $16.25. It has so many features. It is not your ordinary tape measure. The power tape measure works at any angle, extends up to 10 feet without bending and without the need for someone to hold the other end. Push button extend and retract feature. A memorable gift for contractors, do-it-yourself enthusiast, engineers, architects, designers, and makes a great gift for any home. Rudee November 27, 2009 Comments Off on Give them a Holiday to Remember!